Rudos took 2/3. Nitro ripped up Aereo's mask in the second, Aereo paid him back the following match. Nitro rolled thru a 'rana and grabbed the bottom rope to beat Aereo, then pulled off his mask post match. tecnicos took 2/3. Arkangel fouled Mr. Cacao right in front of the ref, tried for the pin anyway. Did not work. Skandalo and Arkangel stomped Cacao until the tecnicos ran them off. They continued to brawl after the match. Delta bled, but won in 8:27 with the Delta Special. Titan replaced Guerrero Maya Jr.
Bufete came in with the belts. Signo was the commissioner. Kraneo beat Marco to win the first fall, Rush & Marco beat Olimpico & Kraneo in the second, Psicosis beat Rush in the third - again! - but this time Marco was captain, and Marco hit Psi with the Aero Italiano to keep the titles. Cancerbero replaced Hooligan. Rudos took 2/3. Mr. Cacao goes home with a loss. Rudos took 2/3. Felino was wearing his old mask for some reason. Panther submitted him for the win. Niebla splashed Rush to win the first. Angel de Oro submitted Dragon Rojo with the campana in the second. Escorpion fouled Dorada in the third for the DQ. Super Comando snuck in a foul on Camaleon. Puma beat Cometa, Eufroia beat Triton, Diamante beat Polvora, Atlantis beat Puma, Diamante beat Niebla Roja, Guerrero beat Diamante, Titan beat Euforia, Ultimo Guerrero beat Atlantis, and Euforia snuck in a foul on Titan to give UG the win. Titan & Atlantis demanded a rematch for next week, won't be getting it. Rudos took 1/3, Volador beating Sombra with the Volador Spiral. Tecnicso took 2/3. Aereo and Warrior continue to feud, Aereo sneaking in a foul on Nitro after Astral & Olimpico were eliminated. Pegasso pulled off the upset win in about 7 minutes. Straight falls for the tecnicos, thanks to Niebla and Volador having all sort of problems during the match. They challenged each other after the match. Zeuxis and Mima return from Japan, lose. Escorpion pulled off Mascara's mask in the second (when he had Euforia in the campana) and the third (when Mascara was on the top rope.) Mascara challenged him to a singles match. Hijo del Signo replaced Bobby Zavala, Stuka replaced Metalico. Tecnicos took 1/3, Stuka pinning the returning the Nosferatu. Goya's first match back here since losing her mask. Straight falls for the tecnicas, Tiffany getting DQed while attacking Marcela in the second. Marcela challenged Tiffany to a hair vs hair match, but Tiffany declined. Looks like Warrior attacked Shocker after the match. 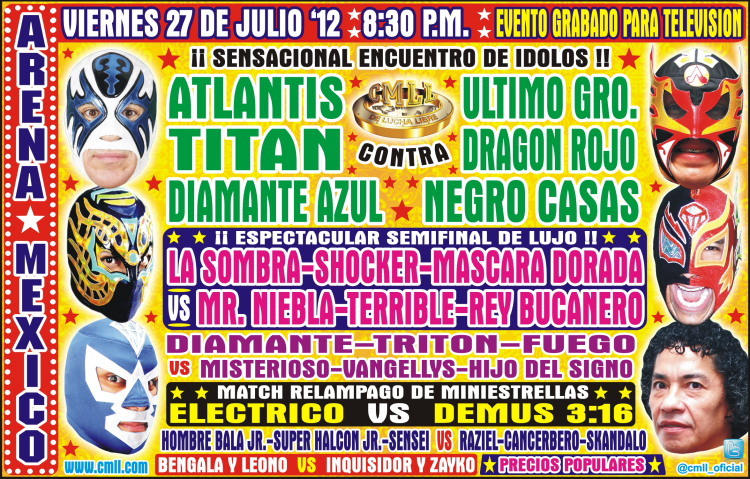 Replaced Dragon Rojo vs Titan title match. Tecnicos yanked rudos masks and rolled them up for the win. Sombra beat Volador, when Volador was overconfident and took a 'rana. Sensei replaced Ramstein, did not have problems with his teammates. Tecnicos took 1/3, Leono beating Apocalipsis. Tecnicos did not perform well, but took falls 2/3. Arkangel & Astral were seconds, though Skandalo appeared to be at ringside as well. Two quick falls to start. Nitro took 2/3 to win the mask. Aereo is Víctor Gonzalo Barragán Hernández, 22 years old. 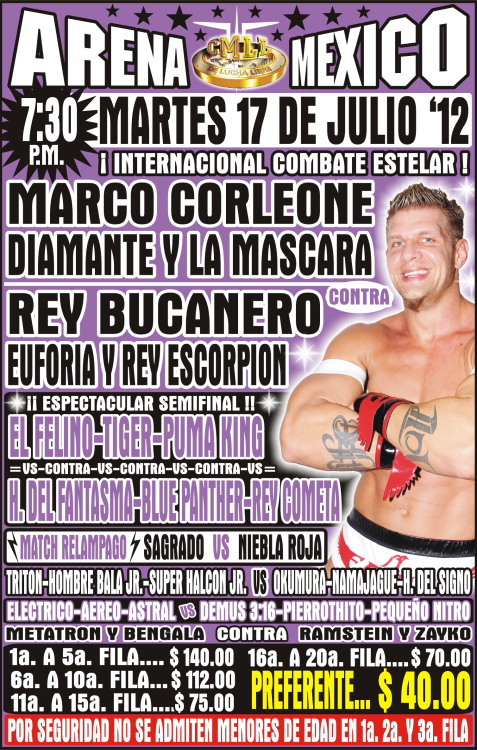 Guerrero Maya replaced Super Porky. Rudos took 2/3. Zac was with Niebla, and Mije was with Volador, in his old Yoda outfit. They battled. 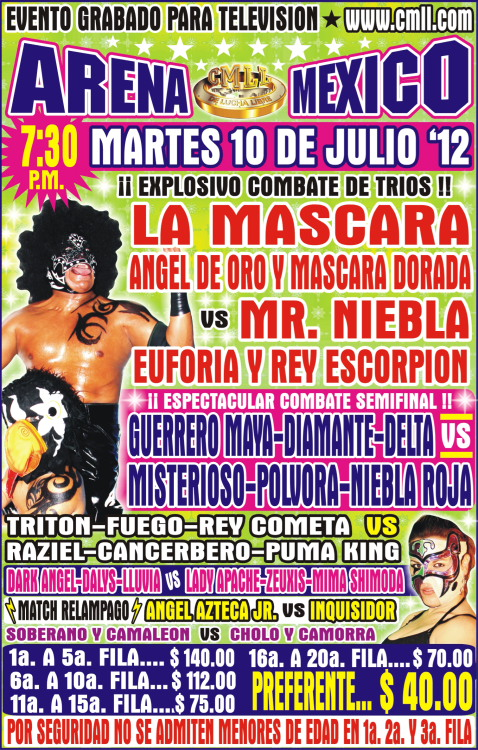 Volador won the first with a backcracker, Niebla took the second with a Nieblina, and the third with a foul. Soberano replaced Bengala, Camorra replaced Ramstein. Okumura pinned Triton in the third. Sagrado won in about 9 minutes. Tecnicos took 2/3, Puma once again fouling Cometa. Puma also took Cometa's mask twice. The reunited cats did not have any issues. Rudos took 2/3, Escorpion powerbombing La Mascara for the win. Escorpion wants a title shot, though the Kaiser Sports report quotes him as challenging for the middleweight title; that's Octagon's title, Mascara is light heavyweight. Cholo was strechered out after a Horuz move. Rudos took 2/3, Nitro winning in his return. Marcela hooked the ropes to pin Tiffany for the win. They fought after the match. Marcela challenged for a hair match, and Tiffany said no. Invasors took 2/3, though Mije took a shot from Valiente near the end. Dragon Rojo defended the belt for the fourth time, taking falls 1/3. This was Titan's title shot for winning En Busca de un Idolo. Horuz was Titan's second. Straight falls. Terrible was subbed in for Mr. Niebla during the week. Both Tiger and La Comandante distracted Rush, allowing Terrible to a glass box on Rush's head. DQ finish, but Terrible was more than satisfied, and challenged Rush to a hair vs hair match. Rush, unconscious and stretchered out, did not respond. Team Jungle Animals took fall 1/3. Rush pinned Terrible clean with a back suplex and a senton. Rush then took care of old business, accepting Terrible's hair match challenge from Friday. 1) Camorra & Misterioso Jr. b Camaleón & Soberano Jr.
Misterioso replaced Ramstein, and ran over the tecnicos for straight falls. Cometa took Puma out with a tornillo at the finish, and the other tecnicos pinned the other rudos. Tiffany attacked the ref again, refused the hair match challenge again. Rudos took 1/3, Mephisto beating Panther with his own nudo lagunero. Event Notes: show canceled due an unrelated protest taking place near the building. Stigma looked good in his Arena Coliseo appearance, landing a Brillo Dorada move in the third. Rudos took 2/3 anyway. Straight falls. Tiffany had Marcela beat, but went for more punches. Tigre Hispano tried to break it up, and Tiffany punched him twice. The first drew the DQ, the second knocked him out. Tiffany still can't beat Marcela. Sagrado won in about 6 minutes. Lluvia pinned Amapola. Poor Amapola. Luna Magica was shaken up by a shot to the head. Rudos took 1/3, Raziel beating Rey Cometa. Tecnicos took 1/3, Sagrado pinning Warrior.